Brahaspati (Jupiter), Saur mandal (Solar System) ke sab se barraa grah (planet) hae. aur ii Suraj se duur 5th planet hae. Brahaspati ke ek gas giant planet bola jaawe hae, kaahe ki ii bahut barraa hae aur gas se banaa hae. Duusra giant planet hae Sanigrah (Saturn), Arungrah (Uranus) aur Varungrah (Neptune). Brahaspati ke wajan 1.8986×1027 kg hae jon ki Dunia se 317.8 dafe jaada hae. This is twice the mass of all the other planets in the Solar System put together. Brahaspati ke purana Romans log jaanat rahin aur uu logan iske Roman god, Jupiter, (Latin: luppiter) ke naam ke baad rakkhin rahaa. Brahaspati, raat ke aasmaan me tiisra sab se brightest object hae, Chandarma aur Venus ke baad me. Brahaspati ke lage kamti se kamti 63 chandarma hae, jisme se 55 5km diameter se chhota hae. Chaar khaar chandarma hae Io, Europa, Ganymede aur Callisto. A series of photographs taken by Voyager 1 as it approached Jupiter, made into an animation. An animation of part of Jupiter's cloud system. The animation is made of over 40 photographs taken by the Cassini spacecraft between October 31 and November 9, 2000. 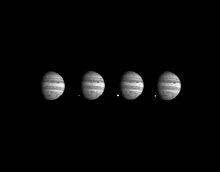 Four photographs of Jupiter taken in 1994. The bright white spots are explosions where parts of the comet Shoemaker Levy-9 hit the planet. An picture by an artist of the Voyager 1 spacecraft that flew past Jupiter in 1979. Brahaspati ke surface ke hawaa me 85.8 to 89.8% hydrogen, 8.2 to 12.2% helium, aur 1% duusra gas hae. Planet ke aur bhittar jaao tab bahut garam rahe hae aur pressure etna jada rahe hae ki helium ras ban jaae hae aur planet ke bhitar paani barrse hae. Brahaspati ke gas Saturn ke rakam hae lekin ii Neptune aur Uranus se different har jahaan pe aur kamti hydrogen aur helium gas hae. Jaada garmi aur pressure ke kaaran scientist logan ii nai batae sake hae ki Brahaspati ke biich me kon chij hae, kaahe ki ii rakam ke pressure dunia me nai mile hae. Iske biich se thorra bahar jaao tab ek mota hydrogen ke ras hae. Ii pressure etna jaada hae ki hydrogen karraa hoe jaawe hae lekin fir se garmii ke kaaran ras ban jaawe hae. ↑ 6.0 6.1 6.2 6.3 6.4 Seidelmann, P. Kenneth; Archinal, B. A.; A’Hearn, M. F.; et al. (2007). "Report of the IAU/IAGWorking Group on cartographic coordinates and rotational elements: 2006". Celestial Mechanics and Dynamical Astronomy 90 (3): 155–180. doi:10.1007/s10569-007-9072-y. http://adsabs.harvard.edu/doi/10.1007/s10569-007-9072-y. Retrieved 2007-08-28. ↑ 12.0 12.1 12.2 12.3 12.4 "Jupiter - A world book". NASA. Retrieved 2009-07-20. ↑ "Etymology of Jupiter". Etym Online. Retrieved 2009-07-20. ↑ Bunson, Mathew (in English). A Dictionary of the Roman Empire. Oxford University Press. ISBN 9780195102338. ↑ "The biggest single object we can see in our galaxy, with the unaided eye". NASA. Retrieved 2009-07-20. ↑ "Highlights of the Galileo Probe Mass Spectrometer Investigation". Retrieved 2009-07-20. ↑ Elkins-Tanton, Linda T. (2006). Jupiter and Saturn. New York: Chelsea House. ↑ Jupiter. NASA. Retrieved on 20 July 2009. Jupiter Profile. NASA's Solar System Exploration NASA. Retrieved on 5 September 2009. Jupiter Fact Sheet. NASA. Retrieved on 5 September 2009. Moons of Jupiter articles in Planetary Science Research Discoveries. Planetary Science Research Discoveries. Retrieved on 5 September 2009.